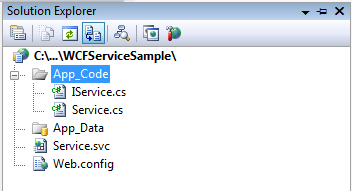 Here IService.cs is an interface it contains Service contracts and Data Contracts and Service.cs is a normal class inherited by IService where you can all the methods and other stuff. In above code if you observe we changed endpoint behavior to support web HTTP requests and this endpoint settings will work with WebInvoke attribute and AspNetCompatibilityRequirements attribute to support HTTP requests with jQuery. Is this code work from cross domain ? This Code Doesn't working on my PC. i have hosted my service in IIS . when i call through client , the CLIENT"S web.config file is not getting updated . I have searched through net but havn't yet got a proper answer . Any help would be appriciated .Thanks in Advance .